Recently, I ran across something (I don't even remember what) that inspired me to look into a poetry memorization program for the girls. I want my daughters to easily recite poetry, but I can be lazy (being totally real here), and I don't want to spend my time searching around for the best poems to memorize. I want a pre-packaged, ready-to-use poetry memorization program. But, does something like that even exist? Oh, yes, friends, it certainly does! After checking around, I ran across Institute for Excellence in Writing's Linguistic Development Through Poetry Memorization. Linguistic Development Through Poetry Memorization provides a system to reintroduce you and your children to a vital but often neglected source of powerful and sophisticated linguistic patterning available to children: memorized language, especially memorized poetry. This teaching tool includes a book with over 75 complete poems, plus speech and soliloquy recommendations, as well as all the poems read on CD for ease of memorization. Instructions, memory charts, certificates, and poet biographies are included. You will also receive a bonus DVD of Andrew Pudewa's conference talk, "Nurturing Competent Communicators." I was immediately interested in this program because it's from Andrew Pudewa, whom my girls will become very familiar with when they start writing in the Classical Conversations Essentials program in a few years. I've heard nothing but great things about IEW, so I knew this would be worth looking into. 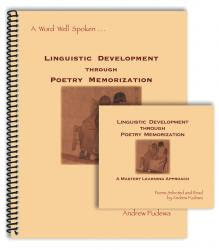 Linguistic Development Through Poetry Memorization is exactly what I was looking for, in that it's an open-and-go program. Three to four times a day, Mary reviews and then recites her poems. When she has learned a poem, she begins the next one in the book, but she still recites every poem she's learned everyday. Repetition, repetition, repetition. Sounds pretty familiar if you're acquainted with the Classical model of education. This is just great! He is so passionate and inspirational - I love watching it! But why would a writing program concern itself with poetry memorization? Mary has loved it, as well as Anna! Both of them are memorizing poetry rather quickly, and they enjoy doing it. After each meal, Mary hops down from her chair, stands in a special spot, and recites the poetry she has memorized so far. Repetition. If you're interested in teaching your children how to memorize poetry to become good writers and communicators, but you're unsure how to go about doing it, you may want to look into IEW's Linguistic Development Through Poetry Memorization. It's been such a blessing to our family! I think you'll really like the program, Suzanne. It's so easy and all right there ready for you! :) Yes, the timeline cards came down. :( I hope you had a happy 4th of July! Thanks for another great informative post. I am starting to plan out curriculum for next year and this seems like something I will definitely look into. I found this used and reasonably priced (wahoo!!!) over the summer, and I snatched it up after reading your recommendation of it here. We used it today for the first time, and my boys LOVED it!!! they've been saying Ooeey Gooey all day!!! i love, love, love it!!! I love that they're exercising their mental muscle AND having fun at the same time. :) They don't even realize they're learning because they're having so much fun!!! SO glad that you shared this! !